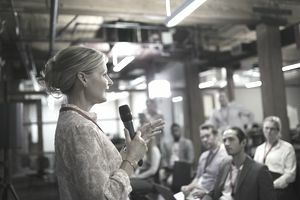 The 5-minute presentation, from an audience perspective, is more engaging and less boring than a typical 60-minute talk. But the 5-minute presentation is the most challenging of all presentations to create and deliver. How much can and should you cram into those five minutes? What can you do to maximize the time and get the most important information across to the audience? Creating a compelling, focused speech with a single message is the ultimate goal of the 5-minute presentation. Whether you are crafting this short yet powerful presentation for a venture capital pitch, selling a product, or educating an audience — the creation process is the first vital step. But is five minutes enough time? What Can Be Accomplished in 5 Minutes? Napoleon wrote that the reason he beat the Austrians was that they did not know the value of 5 minutes. It took Lincoln less than 5 minutes to deliver his immortal Gettysburg Address. In less than 5 minutes, William Jennings Bryan electrified a great political convention with but a single expression that gave him the nomination for the presidency of the United States. So yes, 5 minutes is enough time. But only if you use those 5 minutes wisely. Apply these five methods to your 5-minute presentation for a memorable means to engage your audience. Dig deep. Although your material is limited for your 5-minute presentation, you will still need to do enough research to understand your topic and extract the essence of your talk. Keep it simple. Once you have the materials, narrow down your topic to one core concept. As stated by Chip and Dan Heath, authors of Made to Stick: Why Some Ideas Survive and Others Die state, "How do we find the essential core of our ideas? To strip an idea down to its core, we must be masters of exclusion." It's all about just one idea. Practice, practice, practice. Rehearsal is critical for a such a short presentation. You have no time to pause or collect your thoughts. To engage your listeners, you will need to be smooth and steady, not bumbling. Lead with wow. During a 5-minute presentation, you have little time to build a case or draw your audience in. The best approach is to lead with a compelling or controversial position. Make them think right of the bat. Tell a story. A presentation full of facts, figures and statistics will quickly lose your audience. One stat may be fine to reinforce a point. but if you want to create a memorable presentation tell a memorable story. A great 5-minute presentation is more than enough time to get business funding, educate an audience or make a sale...as well as a chance for your 5 minutes of fame. While you are perfecting your 5-minute presentation, you may also want to spend some time working on your elevator pitch. This elevator pitch tutorial will help you get started. Not sure collaboration is for you? Here are 5 reasons to go for it.